A bit of old news. Chevrolet had released a special edition of the Chevrolet Camaro - the 2012 Transformers Special Edition Camaro Coupe to create a buzz for the movie 'Transformers: Dark of the Moon'. 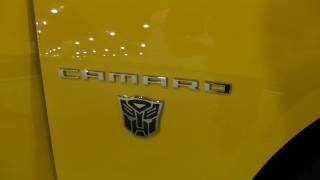 The special edition Camaro is dressed up like the Bumblebee and gives the fan a chance to get behind the wheel of Bumblebee. 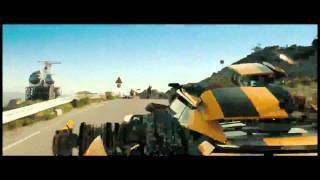 - Transformers 3 - Dark of the Moon wallpapers. Detroit. The Chevrolet Camaro returns as the Autobot "Bumblebee" in Transformers: Dark of the Moon, which opens exclusively in 3D on June 28 and worldwide on June 29. 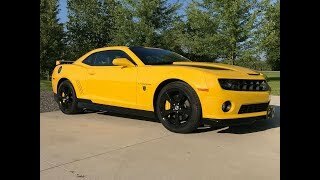 To celebrate, Chevrolet will offer a 2012 Transformers Special Edition Camaro Coupe to Bumblebee fans in the United States, Canada, China, Japan, Europe, South America, and the Middle East. "The Transformers franchise has helped introduce Camaro – and Chevrolet – to a whole new generation of fans," said Rick Scheidt, vice president of Chevrolet marketing in the U.S. "Its role in the films helped make the Camaro the best-selling sports car in America, and one of the best-known cars of any kind around the world." The fifth-generation Camaro previously played Bumblebee in the 2007 film Transformers and in the 2009 film Transformers: Revenge of the Fallen. The films generated $1.5 billion in global box-office sales, and helped reintroduce the Camaro to consumers after a seven-year hiatus from dealerships. In 2009, the Camaro was the most-searched-for car on the web, according to Yahoo!Autos, even though the first models didn't arrive at dealers until late that year. In 2010, the Camaro assumed leadership of the U.S. sports car market from the Ford Mustang for the first time in 24 years. In 2011, the Camaro continues to lead the segment, fueled by the introduction of the Camaro Convertible. Calendar year to date, Camaro has recorded 40,275 sales, compared to the Mustang's 30,206 sales. That momentum is expected to accelerate with the introduction of the 550-hp 2012 Camaro ZL1 in North America early next year, as well as limited-edition models such as the Transformers Special Edition. 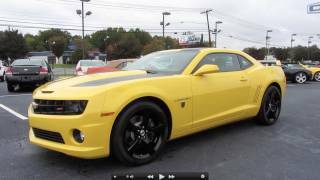 The 2012 Transformers Special Edition will be offered in North America as a package on 2LT and 2SS Camaro Coupes with Rally Yellow paint. In addition to the content offered in the popular RS appearance package, the Transformers edition will feature black rally stripes that stretch over the hood, roof, decklid and unique high-wing rear spoiler, 20-inch, black-painted wheels wrapped in high-performance summer tires, as well as Autobot Shield logos on the center caps and front quarter panels. 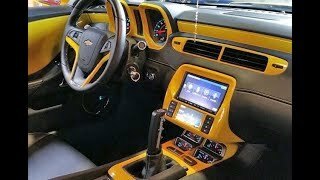 Inside, the Transformers Camaro has a black leather interior accented with yellow stitching on the instrument panel, center console, armrests and seats. Autobot Shield logos are embroidered on the front headrests, as well as the center console lid. Additionally, two dealer-installed options are also available: exclusive, 21-inch, black-painted wheels and a black ground-effects package. Customers may begin ordering the 2012 Transformers Special Edition Camaro beginning in July, with vehicles arriving at dealers in the U.S. and Canada in September. A similar Transformers package will be available in Europe with the launch of the Camaro here in September 2011.